Ticket Time Limits are an important aspect of Revenue Integrity to reduce the number of empty seats left on an aircraft due to late cancellations. Travel Agents will often make speculative or duplicate bookings which need to be cancelled if they are not confirmed within a predefined time limit and seats returned to inventory. 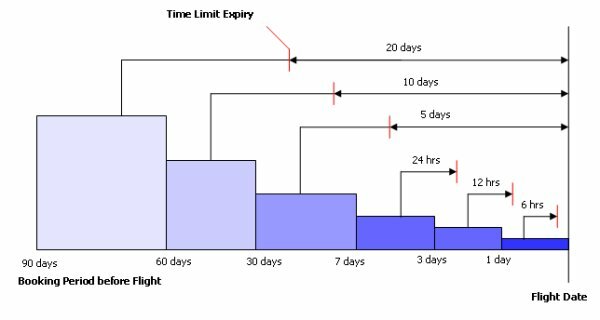 The most widely used option (see example below) is to have varying time limits based on the time period before the flight so that as the flight is reducing in availability space cen be held for a shorter period. This is the default limit set in operating parameters which will apply to all bookings unless overridden by either a high level user who can enter a manual time limit or if a variable time limit has been set for the flights concerned. For example if the security level required to enter a manual time limit is set to 35 and the time limit 12 hours, then all bookings made by agents with a lower security level than this will be cancelled after 12 hours if they have not been ticketed. The system is configured to allow agents above a specified security level to enter a manual ticket time limit. The agent making the booking can enter the date when the booking will expire if not ticketing within that period. They may also enter a specific time for when the booking is cancelled and a queue city which the PNR can be placed. This allows the system to be configured so that bookings made for specific flights are given variable time limits depending on the period that the booking was made. After this period the space held within the PNR is released back to inventory if it has not been ticketed. The example shows 6 different periods leading up to the flight date. Seasons are then created such as a low season in a particular city and within these seasons the booking periods with the range of time limits applicable to them required are added. If the “Before Departure” option is used an additional parameter will become available in which a default time of day that cancellation occurs can be added in hours and minutes. The season created is then applied to a range of flights which is defined by city pair and a date range. VRS allows the airline to set up specific ticket time limits to individual flight numbers. This provides a powerful tool for revenue managers to define different allowances for different markets and times of the day. Flights that sell quickly where inventory is at a premium may attract a short ticketing period to reduce the number of speculative bookings holding space, while flights that sell more slowly may benefit from allowing a longer ticketing period. The system is designed so that when a ticket time limit expries and the inventory is returned for sale, the bookings which have expire will automatically be placed on a queue. This allows agents to log onto the queues and process bookings as required.